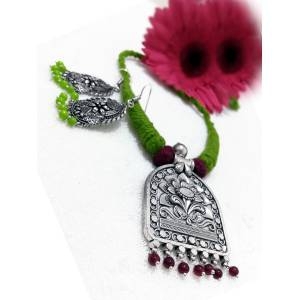 An Indian woman’s attire is incomplete without her Necklace set. It is widely known that, Indian women are very particular about Jewellery. This is the reason why Craftsvilla strives every day to give you the best necklace designs every day. We are a company that is purposed to give you a great variety of necklace sets for each day. Our retailers are experienced, creative, and the best. That is why we can meet the necklace requirements of every woman. We offer necklace for women that is gorgeous, outstanding, breathtaking, and superior quality. Craftsvilla offers perfection at all times. That is why we have a list of satisfied customers who keep coming back for more and more styles! We are confident that we can meet every style need with simplicity as well. 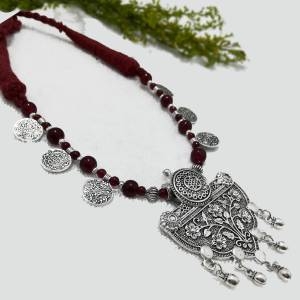 Therefore, start shopping for latest styles and you will get the best of the best necklace set online. Typically, a necklace is a piece of jewelry that is worn around the neck, and it is one of the earliest forms of adornment that humankind wore. When they were introduced, they served the purposes of celebrating in ceremonies, religious functions, magical purposes, and funerals. In the prehistoric period, they were made from natural materials that included shells, bones, feathers, and plants. However, during the Bronze Age period, things changed and they were made from metallic materials. The art of making this accessory evolved and the Ancient Mesopotamia, Ancient Babylon, Ancient Samaria, Ancient Egypt, Ancient Crete, Ancient Greece, and Ancient Rome experienced the best times in making necklaces. They used different precious materials that helped with the evolution of necklaces to what we have today. For those who wore them, they were associated with class and wealth as it was for the upper-class people in the society. Necklace designs were made from different materials, and the main component was a chord, band or chain that would be wrapped around the neck. They were made from precious metals like gold, silver, and platinum. They also had attachments like amulets, pendants, crosses, lockets, and precious or semi-precious materials like sapphire, diamond, pearls, and the likes. From these pioneering countries, the art of making and wearing necklaces spread all over the world and India was one of the countries that treasured such accessories. Looking at the history of jewelry in India, it is almost as old as the country itself. In the modern world, the need for a necklace set has grown even bigger, and that is why Craftsvilla gives you the best necklace designs. The length: there are different necklace lengths. The shortest is 14 inches, and the longest is 33 inches. The length will determine how far you want your necklace to reach. The style: we have different styles of necklaces. They are casual, contemporary, traditional, fashion, and designer necklaces. Under these styles, we have chokers, layered, collar, princess, matinee, and so on. You can choose any style that suits you best. The neckline of what you are wearing: this is also an important guideline. The neckline of the dress will impact your choice. A collar necklace is perfect for v-necks, scoop neck, boat necks, and off-the-shoulder. A choker can be worn with anything but a turtleneck. A matinee can go with anything while a princess necklace is best for high necks, and so on. The color: We have necklaces in different colors. We have Gold, Beige, Brown, Black, Blue and so on. This choice can be guided by your attire. 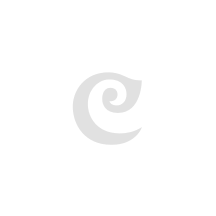 The type: At Craftsvilla, we offer a combo, a necklace set, and a single necklace as well. Craftsvilla is a company that has mastered the art of making necklaces. We are a company that ensures we do not step far away from tradition because our traditions are what make us. All our pieces will keep you in touch with our precious cultural heritage that surround our jewelry making practices. Craftsvilla is at your disposal to offer quality necklace designs that will make you stand out in style. What is your favourite pick? 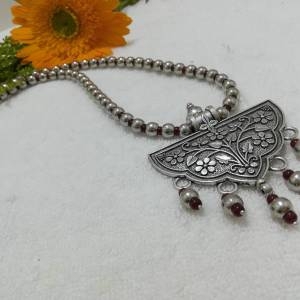 Do you want a choker, a layered necklace set, long traditional Haram, a modern chain, a tribal collar, a Bohemian necklace, a vintage, or an antique necklace? Whatever you fancy, we have got you covered at Craftsvilla. Get our precious necklace set online today. Many things make Craftsvilla stand out. These are security, ease of use, diversity, and value for your money. Craftsvilla products are carefully curated to ensure quality. The security measures that we have incorporated also ensure that any transactional activity done; is on a safe and secure platform. 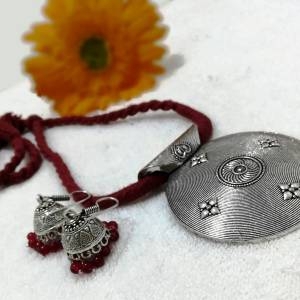 Necklace online shopping with Craftsvilla has also been made easy by using user-friendly interface that makes it easy to navigate, shop, and pay. You will not have any difficulties at all! Diversity also makes shopping with Craftsvilla a delightful experience. We offer very diverse necklace designs that you will not find anywhere else. 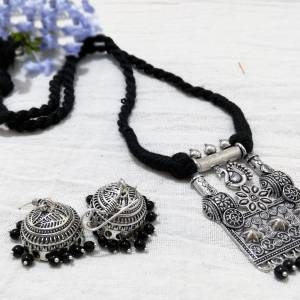 We strive always to provide the public with new collections of necklaces so that they do not get bored with the monotony of seeing the same things again and again When you shop at Craftsvilla, you will also get value for your money. We offer you quality necklace designs at great & amazing prices. They stand out and are worth every penny spent!